We fell in love with Tituss Burgess on "30 Rock," and now we're smitten with him all over again on Netflix's addictive new show "Unbreakable Kimmy Schmidt." If you’ve been lucky enough to watch Netflix’s hilarious mole-woman survivor comedy Unbreakable Kimmy Schmidt, then you know about the treasure trove of funny that is Tituss Burgess. The Broadway actor plays Titus Andromedon, Kimmy’s scene stealing roommate-gay best friend and easily one of the most likable characters to grace the small screen since Sheldon on The Big Bang Theory or Cookie on Empire. This is the second time Burgess, 36, has worked with Tina Fey, one of the executive producers and creators behind Unbreakable Kimmy Schmidt. The two also worked on 30 Rock together, where Burgess enjoyed a recurring role as Angie Jordan’s hairstylist and BFF D’Fwan on the sitcom’s fictional reality show within-a-show Queen of Jordan. ESSENCE.com chatted up Burgess, an Athens, Ga., native, about the role, gay black sidekicks, his guilty pleasure show The Real Housewives of Atlanta and what he’s working on now. Tell us about Titus. What made you want to take the role? His real name is Ronald. Ronald Wilkerson. I know who he is. I know that part of the struggle real well and I genuinely want Titus to get it right, to succeed. And there’s something lovely about the almost not-quite-ness of it all. Everything is just out of reach and I know what that feels like having worked so tirelessly to find my own series. Was it The Lion King? The scenes where Titus tries to stage his own version of The Lion King are my favorite. Can I just say that? I was dying. The house cat? How many takes did you do? How did you keep a straight face? [Laughs] He’s so for real though. He’s so sincere about it. We went all around the world with that one. It was a short little scene but we spent a good two hours. It was a flashback and the one person in the audience was a lawyer from Disney telling Titus to cease and desist. He can’t win. Can’t catch a break. It was brilliant. Did you ad lib at all? Thank you. The singing? I totally ad-libbed. Who’s idea was it for Iron Man or Metal Hero Friend? They wanted to show Titus as someone who’s at the bottom of the totem pole. I think it’s such a great idea to have him be one of those characters at Times Square versus waiting tables. It’s something that’s accessible. People are so used to hearing that as it relates to actors who are not working or struggling actors. But it wouldn’t have had the same gravitational pull especially when they all find out that this guy is keeping their deposits. There’s no restaurant equivalent and they needed to show him really struggling and it is not unrealistic. That could be New York or L.A., right? Yeah. Absolutely. It’s a real thing. Is it like that in Atlanta, too? I don’t know. Atlanta’s appearance in the film and TV world happened after I left. So I didn’t know Atlanta as the mecca it’s sort of become. It’s so bizarre. I was down there for Christmas. They’re trying – but calm down. That’s all I have to say. They think they’re New York but not quite. There’s an interesting energy down there. I don’t have any desire to be down there. Do you watch any of the reality shows out of Atlanta? You played that type of character on 30 Rock? First of all, The Real Housewives of Atlanta is everything to me. It is the best television show. It never gets old. When Apollo came into the club and he was like hugging Phaedra? I was embarrassed for him. That was so creepy. It was disgusting. It was awful. But I live for that TV show. The only reason I asked is because RHOA was one of the first shows to really tap into the notion of gay black sidekicks. To see it in sitcoms now is exciting. What do you think? What I find interesting about the trend is that if they didn’t exist, we’d be pissed. And now that they exist, we’re pissed. People are so quick to call attention to what they describe as stereotypical this, that and the other. And I just think it’s so interesting. It’s like you’re damned if you do, you’re damned if you don’t. I don’t know if Tina is using this as a device. Titus being gay is the least of it. I just think at the core of it is that this man’s repression and the isolation that he has experienced with regards to not being able to get his career going. Him and Kimmy have a whole lot more in common than one might think. When he reads her, it’s hysterical. Are those lines in the script? Oh yes, honey. They are sticklers for every predicate and subject. It is verbatim. Very little is ad-libbed with Tina and if it is, it’s rare. It’s an exact science. In what ways would you say D’Fwan and Titus are different characters? D’Fwan is a cartoon born out of that reality show world. They’re all cartoon characters. Titus is a real person who is absolutely trying to make it. That’s one of the things that I loved about it. When Tina called me about it, I told her, “I’m so nervous that this will be compared to D’Fwan.” And she was like, “We’re going to do everything we can to make him real. To make him three dimensional.” Starting with the struggle of the job and being behind on rent it’s such a universal, uniquely New York way of living. But where is this man getting these clothes? His apartment is kind of cute, too. He’s a hustler. What neighborhood is that supposed to be in? The show fits within the Netflix universe. Were you excited when Netflix picked up the show? Excited but also relieved. We would’ve been out the door. It’s such a specific tonality and we would’ve needed a lot of assistance fitting in in NBC land. There was not a proper lead in. That show belongs somewhere it does not have any restrictions or any handcuffs. Tina and Robert [Carlock] need to be left alone to do what they’ve got to do. 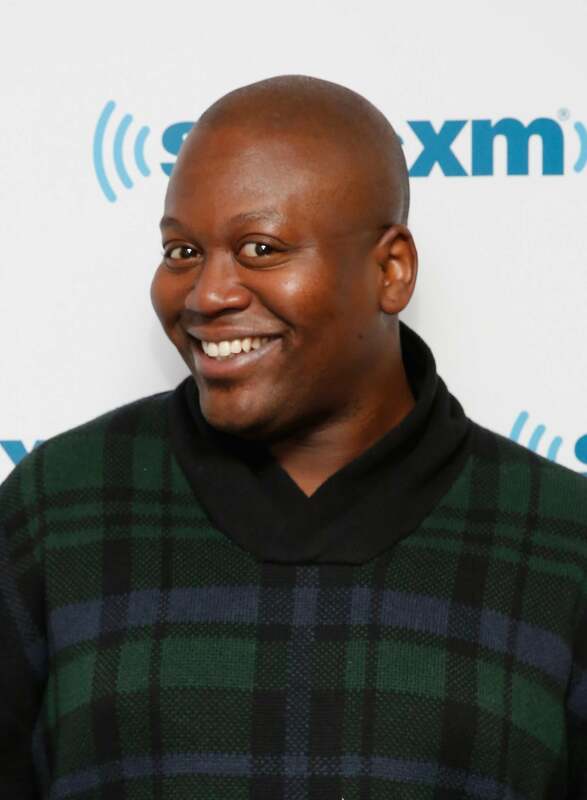 Catch Tituss Burgess on Unbreakable Kimmy Schmidt, currently streaming on Netflix.